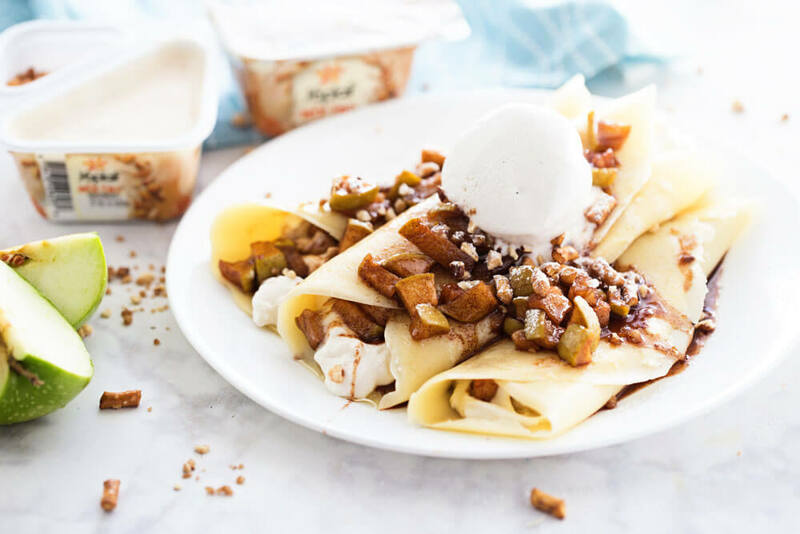 From a family favorite recipe for “rollie pollies,” this Salted Caramel Apple Crepe recipe will make your fall! Growing up, we called crepes “rollie pollies.” I didn’t even know what a crepe was. My aunt named them rollie pollies and I loved them so much. Mmmmmm! Give me a crepe over a pancake any day. The best thing is that you can fill them with whatever you want. So this is my take on a fall crepe. If apples, cinnamon and caramel don’t scream fall, I don’t know what does! First you will make your crepes (recipe below). I have made them many times over the years. One of my friends even got me a crepe maker as a wedding gift. You can then set those crepes aside. And this will make your house smell amaaaaaaaazing. 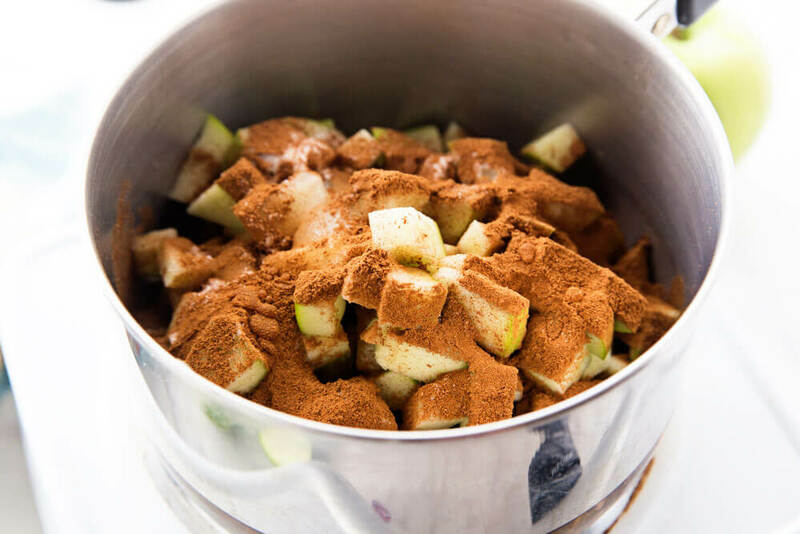 Sugar, apples, cinnamon, oh my! You could add some plain whipped cream as filling but I wanted to add a little more flavor so I mixed it with Yoplait Mix-Ins. Once you have the crepes, syrup and filling, you’ll put it all together. Simply lay your crepe down, add the filling, roll up and top with the syrup. You can use the pretzel parts of the Yoplait Mix-Ins to the top for some salt and crunch. Let’s just keep it real here…. most of the time my kids get cold cereal for breakfast. They are old enough to make themselves food (hallelujah!). I thought we’d never get to this point, but here we are. We make big breakfasts when we have time (usually on the weekends), and sometimes even for dinner but otherwise we are a grab and go kind of family. Having older kids that are super busy makes it tough to sit down and eat all together. So while I have visions of us all gathering round, eating big fancy meals, that’s just not realistic for this stage. I’m learning to let go of that mom guilt. 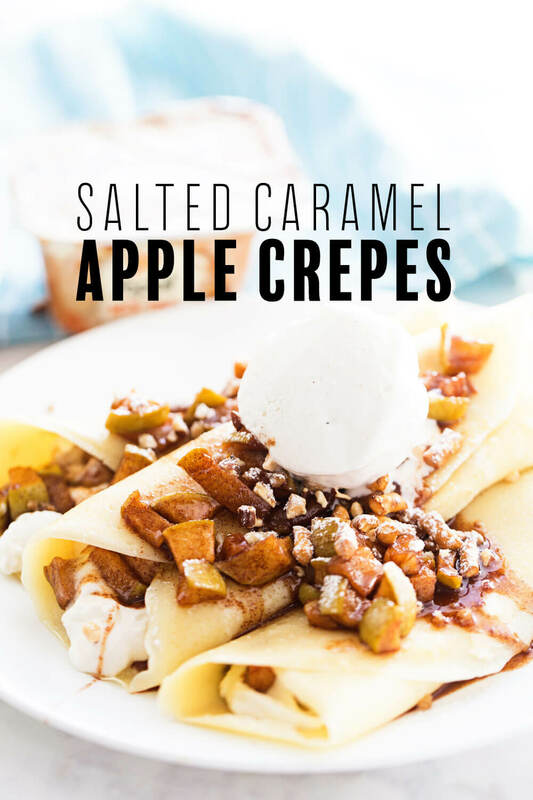 From a family favorite recipe for "rollie pollies," this delicious Salted Caramel Apple Crepe recipe will make your fall! Whisk eggs, milk, sugar and salt. Slowly start stirring in flour, adjusting as you go. Rub oil on pan if not using crepe maker. 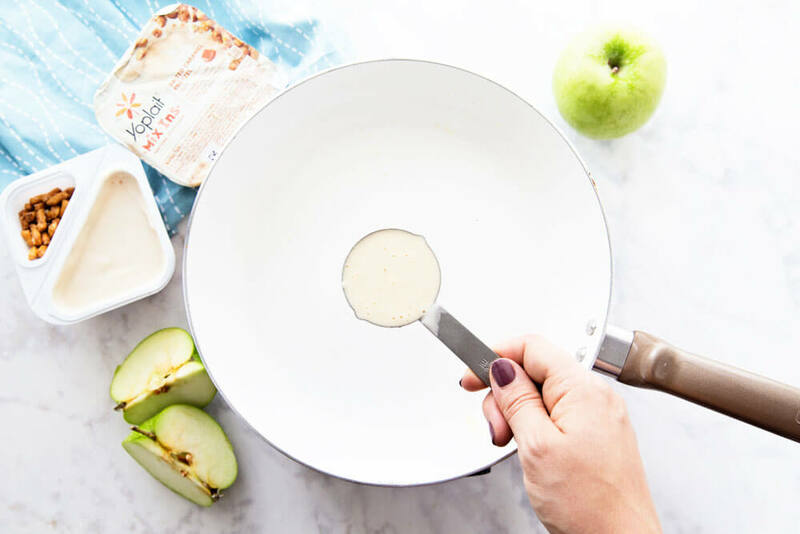 Use a small cup (start with ¼ c) to pour batter into the pan and tilt in a circular motion to cover the pan in a thin layer. Cook for approximately 2 minutes until brown on one side, flip and cook for just 30 more seconds. 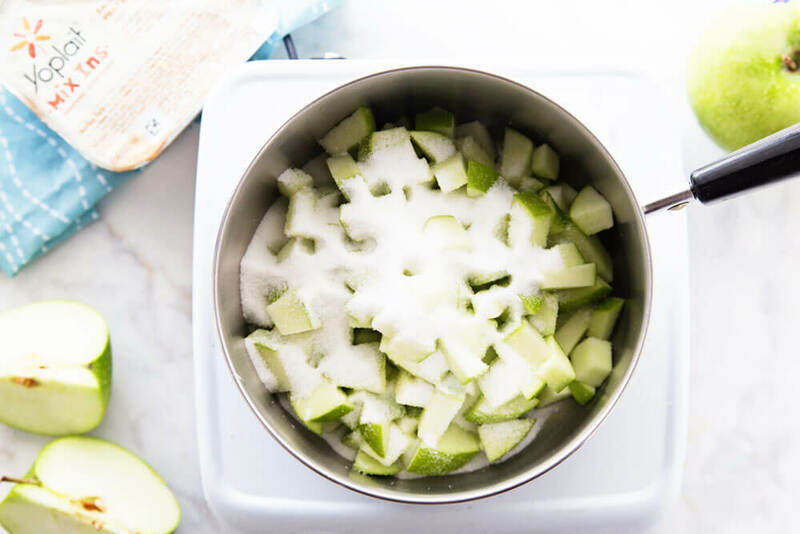 In a saucepan, combine the apples, sugar, cinnamon and water. Reduce the heat to low, and simmer for 10 minutes, or until apples are soft and syrup has thickened. Whip yogurt from Salted Caramel Pretzel Mix Ins with 1 cup whipping cream. 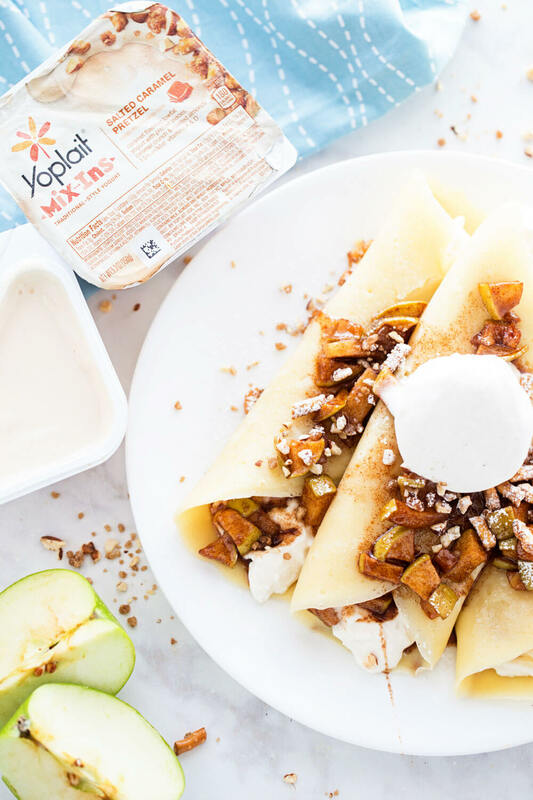 Spread filling into middle of crepe, roll and then top with cinnamon apple syrup and pretzels/crunchy bits from the Yoplait Mix Ins. Top with vanilla ice cream and powdered sugar if desired! If you’re feeling ALL IN and have the time/desire, add a scoop of vanilla ice cream and sprinkle with powdered sugar. This will either make the most amazing breakfast or a fantastic dessert. Either way, you can’t really go wrong. So I’d love to know – what do you call crepes? (or are we the only ones who have a weird name for them?) And do you enjoy big family breakfasts? 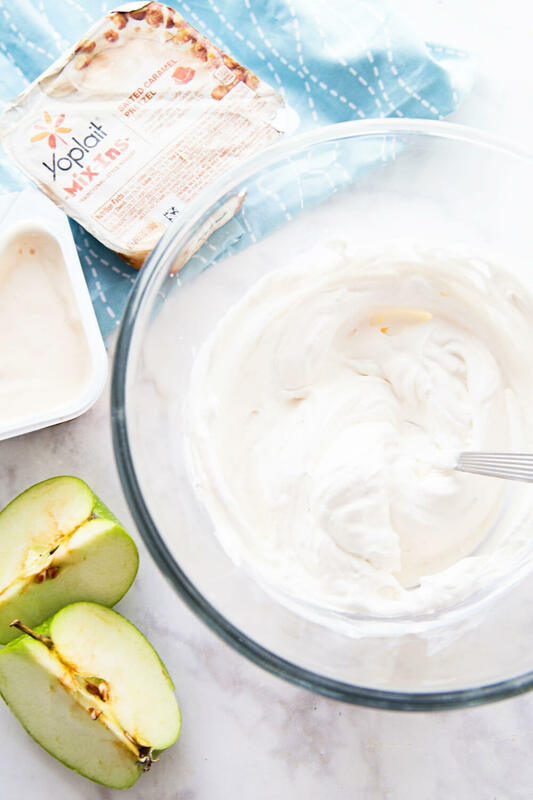 If you’re like me and looking for a quick and easy snack for families on the go, check out new Yoplait Mix-Ins. Wow! 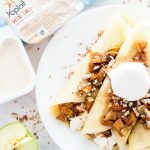 Loved this Apple Crepe recipe. Thanks for sharing. These crepes are making me drool! lol.